Jobu Welcomes back Brian Roberts, who made his triumphant return to the Orioles just last week. Here at Jobu’s Rum, we love a feel good story. Feel good stories are great in every field, but there’s something about feel good sports stories that can really carry a fan base, and even a team sometimes. Although there is no love lost between the Baltimore Orioles and me, I did want to touch upon a story that is not only good for the Orioles, but also good for baseball as a whole. That story is, of course, the return of that damn Brian Roberts (I mean that with the utmost respect). Brian, or Bip as my friends and I refer to him (it’s a shootout to former major leaguer Bip Roberts), recently returned to the O’s after a long battle with post-concussion syndrome that began in late 2010 and limited him to just 39 games in 2011. With all the attention concussions have been getting around sports lately, it’s nice to see Brian work his way back from one after such a long haul. The problems all started really by his own hand, on September 27th of 2010. Roberts, frustrated by an at bat gone awry, hit himself in the head with his helmet. He would miss the remainder of the season, but came back strong in Spring Training and ready to play. That all came crashing down on May 16th of 2011 against the Red Sox, when he was hit in the head while sliding into first base on an grounder to the mound. No one even hit him, nor did he collide with anything, he simply was concussed by the force with which he hit the ground. That was it for the next thirteen months. From what I have read, concussions come with migraines, dizziness and loss of memory and balance. Imagine suffering from that for months at a time, and you have what Roberts went through. I remember earlier this season, when the Orioles were in town playing the Yankees, Michael Kay told a story about how, after a year, Roberts was able to play in minor league games. However, when he got to the big league ballpark, the size of the crowds and the brightness of the lights brought back those symptoms. I guess you never know what to expect with head injuries, and that’s why they’re so scary (look at Justin Morneau too). Anyway, as I said, this is a story with a happy ending. 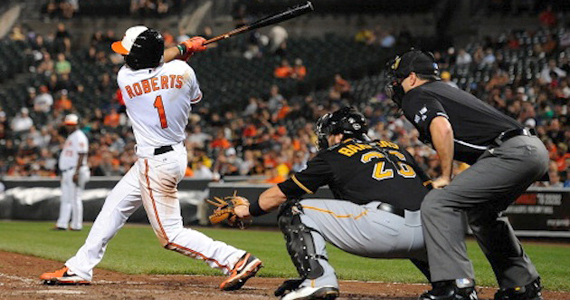 On June 13th, Roberts finally made it all the way back to a big league field, playing against the Pittsburgh Pirates in his first major league action in almost thirteen months. What did Roberts do? Batting leadoff, he got three hits in an Orioles win (of course!). Since then, the 34-year old has played in seven games, and hit .241 in 29 at bats (as of Wednesday morning). Roberts’ career does not come without a little controversy (he admitted to trying steroids one time, in 2003, after his name came up in the infamous Jason Grimsley statement of 2006), but I feel like he’s one of the “good guys” of the sport. Despite the steroids admission, he’s always been that pesky doubles hitter** that everyone loves on their team but hates when their pitchers have to face him. He also has always played the game the correct way, hustling and playing fundamentally sound defense. His return could be the thing that keeps the Orioles from their typical mid-summer collapse and keeps them in contention for the entire season. As things stand now, the Orioles are in second place in the AL East, X games behind the Yankees, so they’ll need Brian if they’re going to have a chance to make the playoffs for the first time since 1997. Welcome back Brian, now I can go back to hating you twenty times a year, and I’m excited about that. ** Brian is not just a Punch and Judy slap hitter though, he is usually around ten home runs per season, with career highs of 18 and 16 in 2005 and 2009 respectively. You can check out his career stats here, courtesy of Baseball Reference.